Lubrizol's Stat-Rite S-680, an inherently static dissipative (10e6 to 10e8) PETG alloy to provide clean, permanent Esd protection, even after thermoforming. This ultra clean, heat resistant (60C/140F) plastic is an excellent choice for use within the electronics,defense and medical industries. Sheets available in .010 to .080" thicknesses. Please be advised that lead times for this material can vary up to 12 weeks, FOB:California. Minimums apply. Call for sample material and spec sheet. Zelux SD-P, a permanently static dissipative (10e7 to lOell) Polycarbonate plastic with high flexural strength and good thermal stability to 270F/132C. UL94 V-0 rated at .030", this material is thermoformable in .010 to .060" gauges and has low outgassing properties. Minimums may apply and lead times can be up to 10 weeks. Please call for sample material and spec sheet. Royalite R63 Conductive (10e3 to lOe5) ABS/PVC plastic sheet both electrically conductive and fire rated. Thicknesses from .030 to .060. Available with low lead times and low quantities. R63 meets the minimum static requirements of MIL-8-81705C and NFPA Code 99 specs. Call for sample material and spec sheet. Pacur, a clear.static dissipative (10e6 to 10e8) thermoformable plastic. 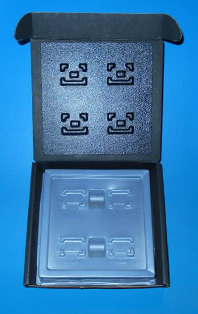 Clear/transparent, tough and permanent proprietary abrasion resistant Esd plastic. Designed to withstand repeated cleanings with water/detergents while maintaining fully its static dissipative properties. Please consider Tandem Esd as a source for the design and fabrication of custom interior foam packaging/cushioning, employing conductive or static dissipative cross-linked polyethylene zote foams for critical static sensitive applications. Anti-static (10e9 to lOell) pink Polyethylene and Urethane foams are available for less critical device packaging. Allow Tandem to combine the above packaging applicatiions with a static dissipative (S/D) or Conductive styled box for a complete Esd and physically protective package for all environments. Tandem offers many types of Esd safe bags: anti-static, static shielding and the "Static Intercept" brown plastic bag from Engineered Materials, Inc. (EMI). All bags are sold in the following styles: flat, on rolls, various mil thicknesses, gusseted, square bottom and/or shrouds. Note: the "Static Intercept" bag was developed by Lucent Bell Labs to solve the dual problems of corrosion and Esd damage. The bags will prevent latent defects caused by metal corrosion/tarnishing and static contamination. No other bag on the market can accomplish this dual purpose. Please call or email for spec and MSDS sheets and samples.